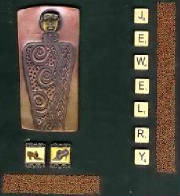 Bead Bar Pin~ This is a wonderful way to display your larger hole beads that you love but don't want to permanently incorporate into a project. Pictured are three on a silver tone chain. I also had another idea for these...thought they would be great to use as doll arms/legs with shrink plastic. They measure approx. 2 1/4" long and come in silver and gold tone. The top screws off to allow beads to go on, then screw tight. Nickel Pin Back With Bail~I love this pin back. You can use your pin as a pin or wear it on cord or chain around your neck. It measures 3/4" wide. Pkg of 6. Self Adhesive Copper Tape~ Measures 1/4" wide and 9 feet long (108"). This is great to add a stained glass look to your microscope slides, acrylic pieces and shrink plastic. Use for many other applications. This is real copper so it will age plus it is acid free. Wire Beads~Brightly colored kooky shapes & sizes, I think they would be fun used with fibers. Appox. 100 pcs/Pkg, 24 ga. Colors: silver, gold, copper, red, purple, green, turquoise. Beading Mat~ This quickly became one of my personal favorites after I bought one. It is double sided, cream colored, soft & comfortable and really keeps your beads from escaping. It measures 7.75" x 7.75" and comes package of 2. It doesn't seem to accumulate pet hair quickly either as we have 2 dogs and 2 kitties. It is washable and wrinkle ressistant. Magnetic Hematite Beads~ Cut tube shape (6 sided), 5 x 8 mm. These are fun. The magnets are really strong in them. Make a lariat style bracelet and wrap around your wrist several times for a fun look, these magnetic beads will keep it on as they cling to each other. Pkg, 18 beads. Victorian Style Shoe Charms~ Adorable, they come pre-drilled with 2 horizontal holes for jewelry making. They measure approx. 1/2" wide and approx. 3/4" high. Pkg. of 3. Lanyard Hooks~ Typically used for making name tags & badges, you can have some jewelery fun with them also. Add a jump ring and beads for a "Purse Pretty" to dangle from your purse or wallet. Some cell phones have an area this could hang from like your Purse Pretty. Hang them from a chain, fibers, eyelets (larger size), books, etc. It measures almost 1" long and approx 1/4" at its widest. Only in silver. These are also great to attach to those zipper pulls on wallets, purses, organizers, etc. that seem to be very hard to pull. Bulk pricing is available for quantites 1 gross and larger. Pkg. 28. Bent Nose Tweezers for picking up beads and other small, delicate items, will be found on the Book Making & Paper Tools page.